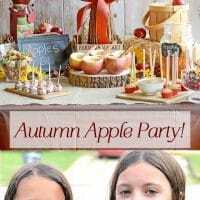 Autumn Apple Party with Apple Recipes! It cooled down to the 70’s and so we had to celebrate the new season approaching fast! There is no time like fall with the crisp air, beautiful scenery and fresh fall flavors! 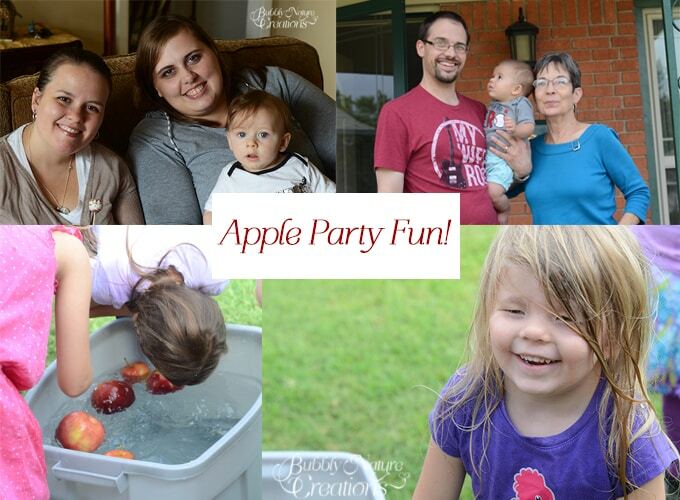 I always think of an apple harvest in September and so we had an Autumn Apple Party with Apple Recipes for our friends and family! I love the new Candy Apple M&M’s from Walmart and so I knew I wanted to add them into the party. 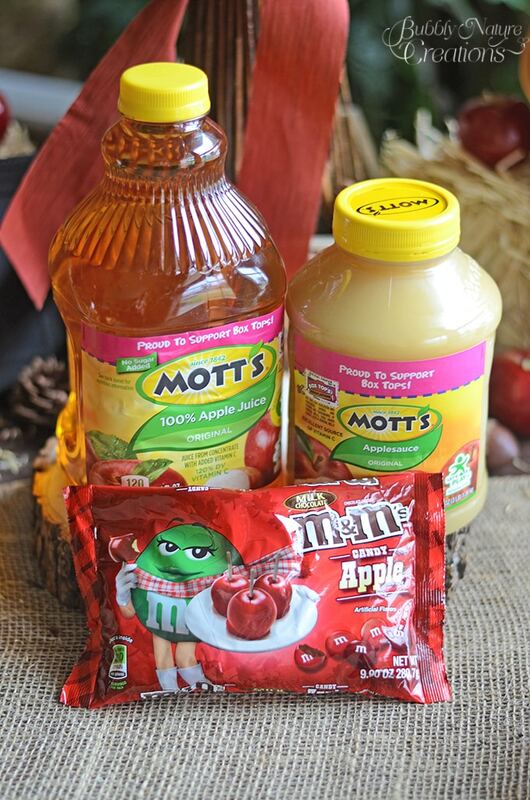 I also used Mott’s Apple Sauce and Mott’s Apple Juice for some easy recipes! 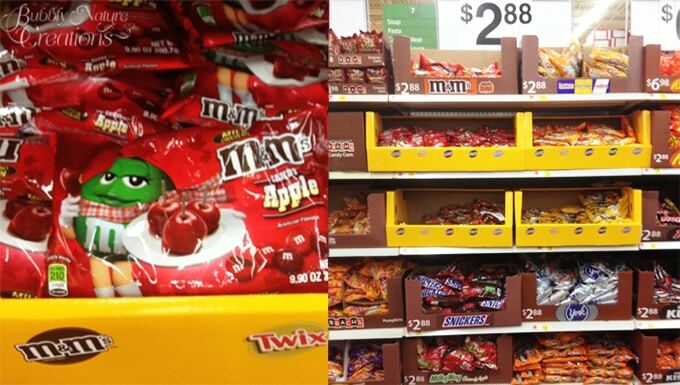 The Candy Apple M&M’s are only found at Walmart which already has a full display of Halloween candy! Yay! Make sure to pick up your coupons at The Flavor of Fall. You can get $1 off any two (2) Mott’s sauce or Mott’s juice drink and $1.50 off any two (2) M&M’s brand chocolate candies! I think the fun foods we had turned out great. These Candy Apple Grapes turned out so cute and everyone loved them! 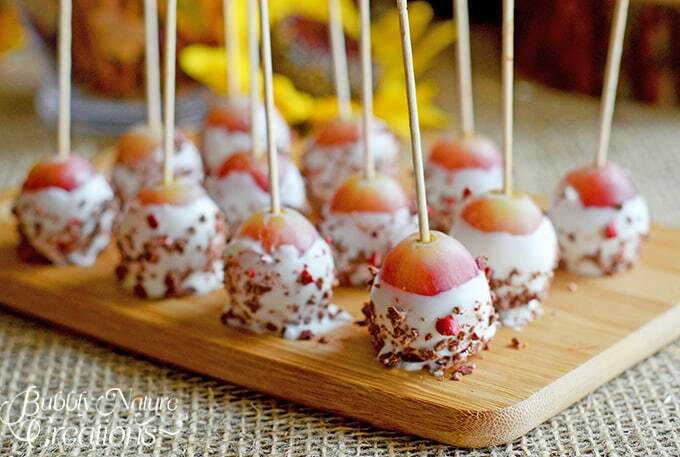 We made them by coating the grapes with white candy coating then sprinkled chopped Candy Apple M&M’s on the coating. Just let them dry on a piece of parchment paper then serve with a long toothpick. 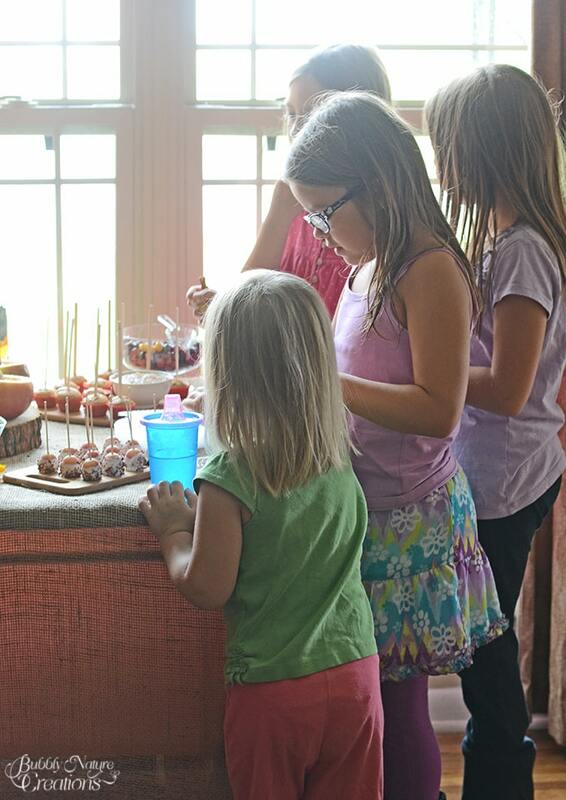 Of course an Apple Party needs some Apple Cider. I made these cute Apple Cups by just hollowing out the insides of some large apples with a knife. They turned out so cute! 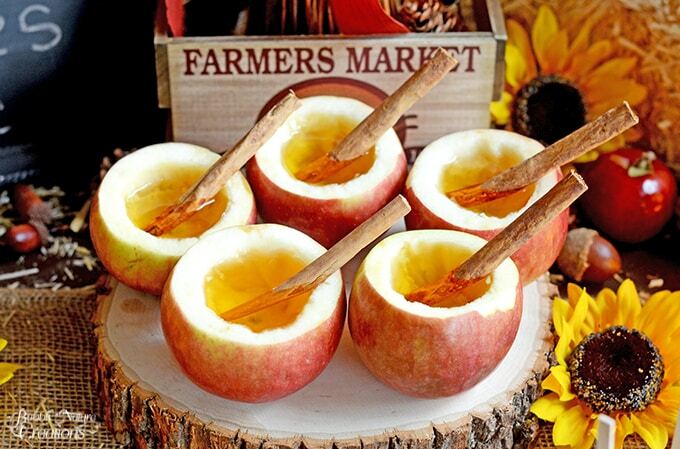 I made some Easy Apple Cider to go in them using 2 cinnamon sticks and 2 cloves in a piece of cheesecloth and a 48oz. jar of Mott’s Apple Juice . Just boil the ingredients for 10 minutes in a large pot and then turn down the heat to simmer and serve warm in your apple cups! So fun! I also served up some Apple Cinnamon Muffins made from a mix and Easy Apple Butter that I made with Mott’s Apple Sauce! 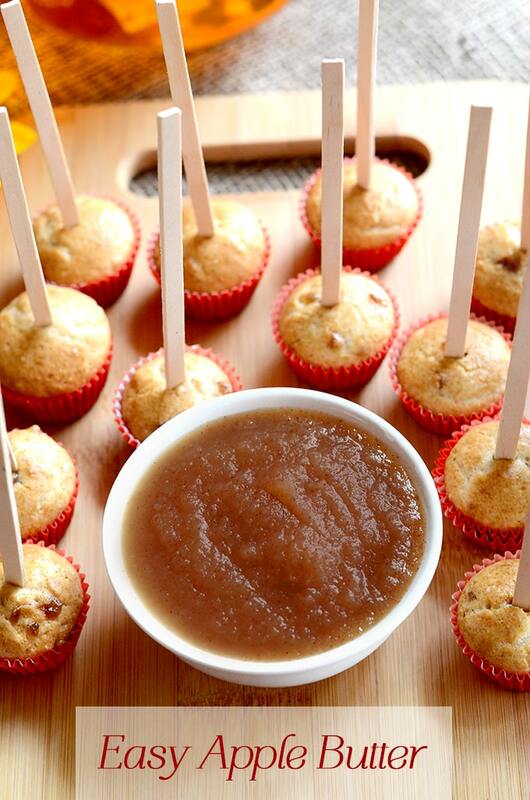 We had fun dipping the mini muffins into the apple butter and it was very tasty! 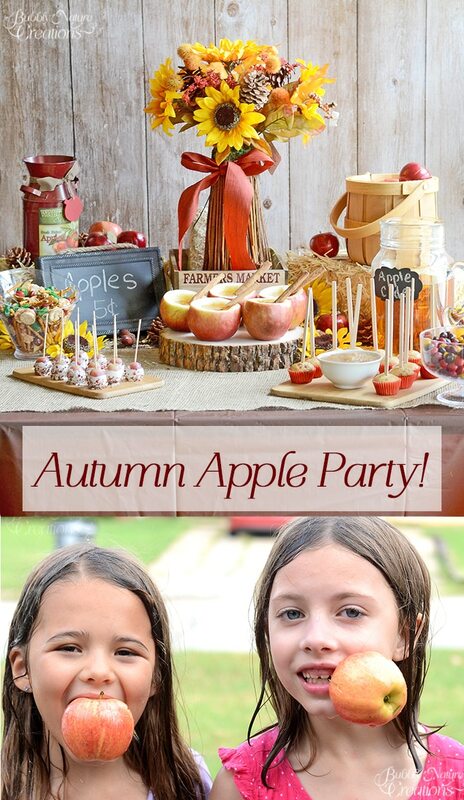 Autumn Apple Party with Apple Recipes!Fun ideas and recipes like Easy Apple Butter! Combine ingredients in a small saucepan and bring to a boil. Reduce heat to a simmer. Cover and simmer for 30 minutes stirring every few minutes. Take off heat and let cool. 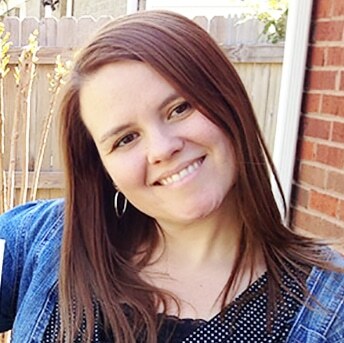 Transfer to a storage container and store in the refrigerator until ready to serve. This Caramel Apple Snack Mix is one that I had made a few days before and knew I had to make it again it was so good! 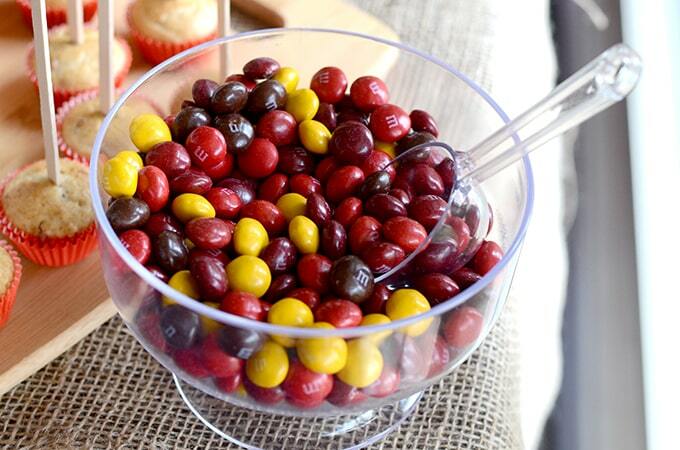 I mixed in the Candy Apple M&M’s with some other yummy caramel apple flavors! 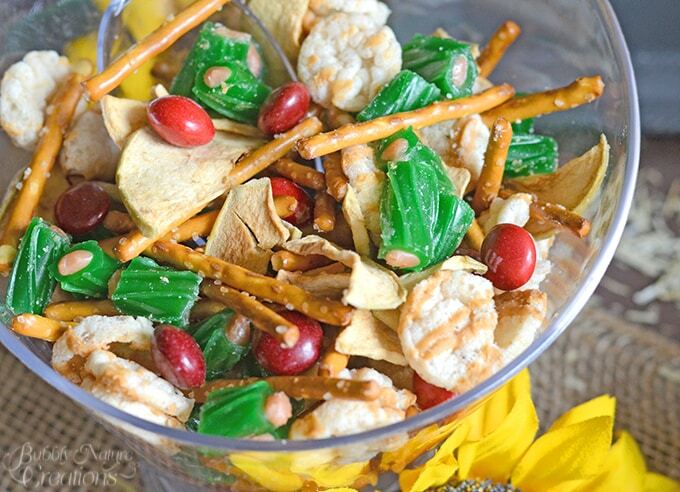 You can find the recipe on my Caramel Apple Snack Mix Post! 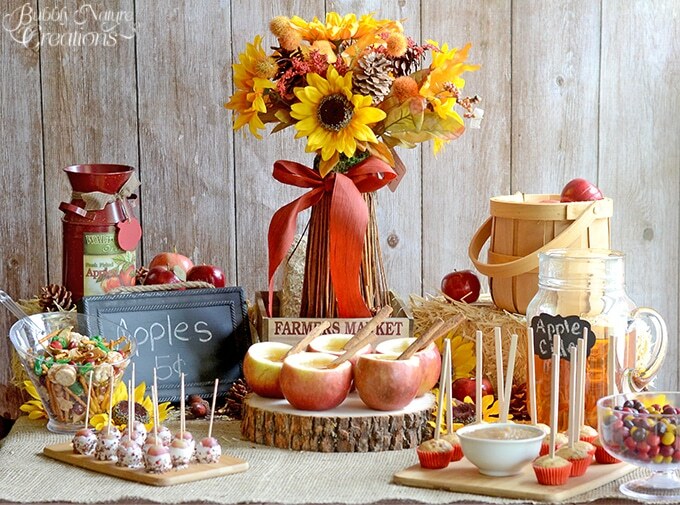 These Fall colored M&M’s and the Candy Apple M&M’s were perfect to serve alongside all the other foods and decor. I found most of the decorations at Walmart too. Sunflowers and rustic accents were perfect for the decor. I love how the pops of red and yellow turned out against the wood backdrop. As soon as everything was ready the kids rushed to the table and started filling their plates right away. After we ate we had a fun game of bobbing for apples! This caused lots of giggles and grins as the kids got soaking wet!!! We just filled a big container with water and apples and let them go at it! It was a fun way to end our party and a great way to celebrate the new season!